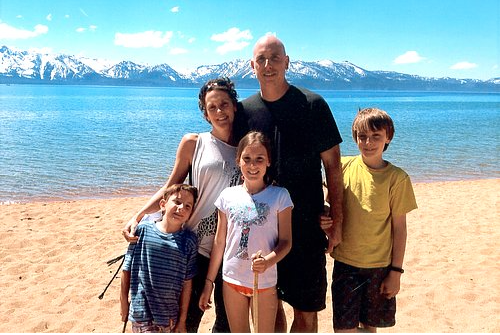 The following is Katherine Baumann’s letter sharing how a special gift helped her daughter-in-law, Elizabeth, navigate her battle with cancer near the end of her life. My daughter-in-law Elizabeth died of cancer on December 6, 2012. She was 44 years old and the mother of 3 young children. Although she did not belong to any organized religion, she was drawn to the Buddha symbol and this inclination manifested itself in the large Buddha statue greeting visitors on the front porch of their home, the jewelry she purchased and even the numerous pieces of clothing she wore displaying the peaceful Buddha. Near the end of her life, her cousin Tracy, sharing her love of Buddha, presented her with a beautiful string of pink opals and rose quartz Mala Beads along with a large picture of the Peaceful Buddha signed by many relatives, close friends and cancer survivors in the community. The Buddhist-blessed beads were never far from her from that moment on—she asked that they always be placed under her pillow. We would recite the mantra with her and continued to do so even when she became unable to participate. This practice kept us grounded in the moment during our care giving and brought comfort to all of us. The Buddha will forever symbolize peace during Elizabeth’s difficult journey. All the women in our family now proudly wear the Peaceful Buddha necklace close to our hearts in honor of Elizabeth. It is so meaningful and such a wonderful reminder of Elizabeth. After seeing all that Elizabeth and her family endured, as well as many other families’ challenges with cancer, Tracy was moved to bring this tangible means of peace and comfort to cancer patients in need. She brought an image of Jizo Bosatsu, a peaceful Buddhist monk praying, to Matthew Taylor and asked that he design a pendant from the inspirational and peaceful image. Matthew immediately set to work and carved a wax mold through the night. The very next day Matthew had the prototype ready to cast and the Peaceful Buddha Necklace was born. Working with Matthew’s wife and business partner, Bri, Tracy created a communications plan and web presence to spread the word. The initial proceeds from the necklaces were donated to the Cancer Patient Support Program’s Emergency Fund, and Tracy’s vision of bringing comfort to those in need was realized. Now the Love Light Compassion Foundation and its expanded jewelry line provide assistance around the world. The Love Light Compassion Foundation team hopes that the entire jewelry line will bring light, peace and comfort to all who are touched by disease: patients, family and friends. Love Light Compassion Jewelry is a beautiful reminder of living a life of love and compassion and helping our global community.